Former chief rabbi, Rabbi Yonah Metzger, freed from jail but will spend 15 days under house arrest. Former chief rabbi, Rabbi Yonah Metzger, has been released to 15 days of house arrest, after spending eight days in jail. During this period, he is not allowed to leave Israel, to hold meetings or to talk to the media, and has been instructed to deposit 500,000 shekels in bail money. There have been reports of threats against witnesses who testified against Rabbi Metzger. One of the two state's witnesses told Israel Hayom, however, that he does not intend to leave Israel, contrary to rumors in hareidi circles. The witness reportedly had graffiti scrawled on his home's walls and received threats. "I am alright," he said, "and not going anywhere." 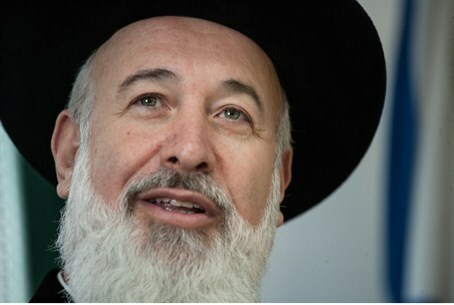 Rabbi Metzger was arrested on suspicion of taking bribes, obstructing investigation and pressuring witnesses. The rabbi is suspected of soliciting contributions to NGOs when he was chief rabbi and siphoning the funds into his own pocket.